Everybody who studied the cluttered history of the world after the brutal endings of World War II knows that a lot of the problems that have continued through today could have been solved had Roosevelt's Four Freedoms and the commitment from parts of the U.S. leadership to an end to colonialism been kept. But that was not to be, and instead the scraps of the French, Dutch, British, Spanish, Portuguese and a handful of other empires were allowed to continue -- and fester -- into the 1950s and beyond. We are still paying for those mistakes, since once the major colonial powers had been weakened (each in its own way) there was no future in the colonies for the colonialists whether they were French in Algeria, Portuguese in several places in Africa (that most Americans today couldn't find on a map), the British just about everywhere -- or the French in "Indochina." By early 1945, U.S. soldiers with the "Office of Strategic Services" (the predecessor to the CIA) were working with nationalists and communists in Vietnam against the Japanese who had conquered the country and the Vichy French who were collaborating with the Axis powers (not only the Nazis in Europe, but the Japanese in Asia). 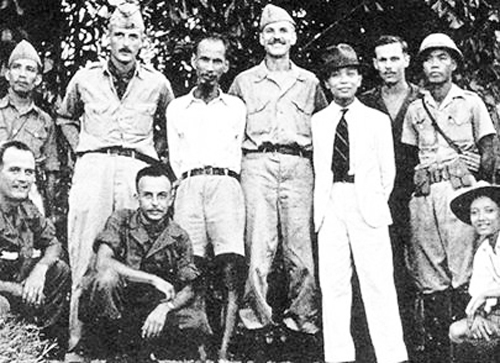 Above, OSS officers (the tall Americans) posed for a picture with Ho Chi Minh (in shorts) and Vo Nguyen Giap (in fedora) during their time fighting the French and Japanese. The U.S. government's leaders ignored Ho Chi Minh's plea to recognize the independence of Vietnam and began supporting the return of the French colonial rule over the country. The French were defeated by the Viet Minh at Dien Bien Phu in 1954, so the USA doubled down on its mistake and slowly took over the colonial war the French had just lost. Twenty-one years later, the last U.S. soldiers left Vietnam, after nearly 60,000 Americans had died and millions of Vietnamese had been killed or crippled, during a war that included one of the most extreme uses of "ecocide" (the deliberate destruction of the environment as part of military strategy) in history. The reason for my writing this on October 4, 2013 is that the news reports are just coming in about the death -- at the age of 102 -- of one of the greatest military leaders in history, Vietnam's Vo Nguyen Giap. Giap was the partner of Ho Chi Minh in leading the anti-colonial struggle of the Vietnamese in "Indochina." Along with Ho Chi Minh and U.S. specialists, Giap participated in the anti-Japanese struggle in Vietnam during the Second World War, while the Vichy French leaders were subordinate rulers after the Japanese conquest. And when the Japanese were kicked out of that part of the world in late 1945, Ho Chi Minh, who had been a communist anti-imperialist since the 1920s, asked the United States to support the independence of his people, quoting the U.S. Declaration of Independence as part of his appeal. Instead, the USA supported the return of the French colonialists, and the "First Vietnam War" followed, from 1946 through 1954 (when Giap led the victory over the French in a valley named Dien Bien Phu). By that time, most of the dollars supporting the French military effort in Vietnam were coming from the USA. And at that point, again, the leaders of the USA had a choice. Allow Ho Chi Minh to be elected President of a Unified Vietnam -- or continue to push the fiction that there could be a "North Vietnam" and a "South Vietnam." The fiction won and two generations of Americans and Vietnamese (along with many Cambodians, Laos, and others) lost. Within five years after the U.S. blocked elections which everyone admitted Ho Chi Minh would have won, the U.S. escalation that became "The Vietnam War" had begun. By 1975, when the last Americans jumped on the helicopters on the roof of the U.S. Embassy in what was then Saigon (it's now Ho Chi Minh City), the suffering and evil had been immense -- and unnecessary had we bothered to know a little history. Readers who want to know a little more about those years can do a quickie by watching two videos. One, the Academy Award winning "Hearts and Minds," has several scenes in my home town of Linden, New Jersey, featuring a high school friend of mine who suffered greatly as a POW in Vietnam but came home to a different world. The other, "Sir No Sir!" gives viewers a bit of history that has been wiped out of most U.S. history books: the story of the "G.I. Movement" that ultimately was the second most important reason why Vietnam became independent and unified again in 1975. (The most important was that the Vietnamese continued fighting for their independence, whether the outside was Japan, France, of the USA). 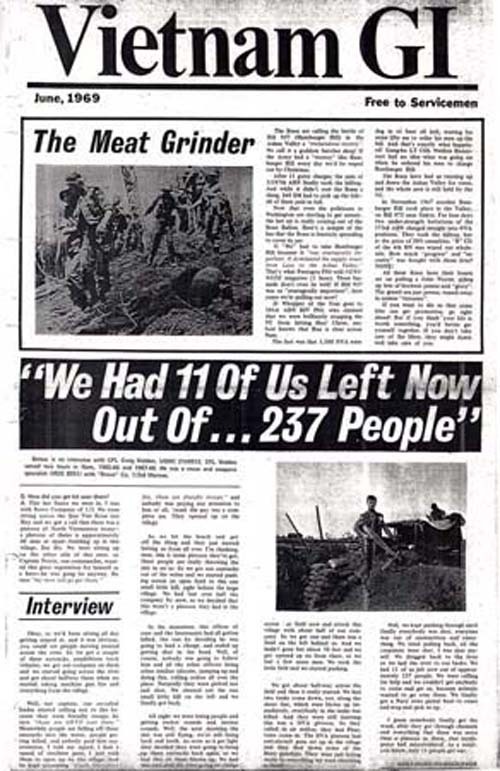 The "underground" newspaper Vietnam GI was published out of Chicago and distributed creatively to thousands of soldiers in Vietnam by the late 1960s. VGI told the stories, such as the one above about "Force Recon" (a way of eliminating American soldiers who had gone "kill crazy") in the June 1969 issue. By 1968, even American corporate media were beginning to report that large numbers of American soldiers were actively opposing the war.There are other notes from the history of Substance, but one mainly for here today. When Substance began in print, it had a certain "look" because I had learned a little about layout and the production of inexpensive tabloid newspapers during my work against the Vietnam War. For those who wish to read one of the ancestors of Substance, Google "Vietnam G.I." one of the most important of the anti Vietnam War newspapers published by soldiers and others during that infamous part of our history. Vo Nguyen Giap Dead: Legendary Vietnam General Dies At 102. 10/04/13 09:37 AM ET EDT HANOI, Vietnam -- HANOI, Vietnam (AP) � Vo Nguyen Giap, the brilliant and ruthless self-taught general who drove the French out of Vietnam to free it from colonial rule and later forced the Americans to abandon their grueling effort to save the country from communism, has died. At age 102, he was the last of Vietnam's old-guard revolutionaries. Giap died Friday evening in a military hospital in the capital of Hanoi where he had spent close to four years growing weaker and suffering from long illnesses, a government official and a source close to Giap said. Both spoke on condition of anonymity because his death had not been formally announced. 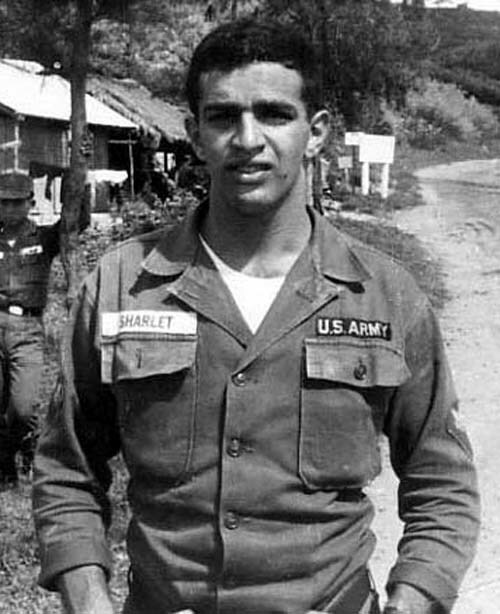 Jeff Sharlet worked in "intelligence" during his time in the U.S. Army in Vietnam. When he came home to the Midwest after his service, he got a graduate fellowship to study and instead of enrolling at Indiana University he used the money to fund the beginning issues of "Vietnam GI." Like many of the veterans who were active against the war in the early days, Sharlet died of cancer. Many attribute those pre-mature deaths of the soldiers who survived their war to the U.S. policies of econcide, which included the massive use of chemical defoliants against the ecology of Vietnam and the other nations of what Western Imperialists called "Indochina. "Giap was a national hero whose legacy was second only to that of his mentor, founding President Ho Chi Minh, who led the country to independence. The so-called "red Napoleon" stood out as the leader of a ragtag army of guerrillas who wore sandals made of car tires and lugged their artillery piece by piece over mountains to encircle and crush the French army at Dien Bien Phu in 1954. The unlikely victory, which is still studied at military schools, led not only to Vietnam's independence but hastened the collapse of colonialism across Indochina and beyond. Giap went on to defeat the U.S.-backed South Vietnam government in April 1975, reuniting a country that had been split into communist and noncommunist states. He regularly accepted heavy combat losses to achieve his goals. "No other wars for national liberation were as fierce or caused as many losses as this war," Giap told The Associated Press in 2005 in one of his last known interviews with foreign media on the eve of the 30th anniversary of the fall of Saigon, the former South Vietnamese capital. "But we still fought because for Vietnam, nothing is more precious than independence and freedom," he said, repeating a famous quote by Ho Chi Minh. NEW YORK TIMES FRONT PAGE OBITUARY APPEARED IN THE PRINT EDITIONS ON OCTOBER 5, 2013. PRINT HEADLINE: Relentless General Who Ousted France and U.S. From Vietnam. By JOSEPH R. GREGORY. Published on line October 4, 2013, print October 5, 2013. Vo Nguyen Giap, the relentless and charismatic North Vietnamese general whose campaigns drove both France and the United States out of Vietnam, died on Friday in Hanoi. He was believed to be 102. General Giap was among the last survivors of a generation of Communist revolutionaries who in the decades after World War II freed Vietnam of colonial rule and fought a superpower to a stalemate. In his later years, he was a living reminder of a war that was mostly old history to the Vietnamese, many of whom were born after it had ended. But he had not faded away. He was regarded as an elder statesman whose hard-line views had softened with the cessation of the war that unified Vietnam. He supported economic reform and closer relations with the United States while publicly warning of the spread of Chinese influence and the environmental costs of industrialization. To his American adversaries, however, from the early 1960s to the mid-1970s, he was perhaps second only to his mentor, Ho Chi Minh, as the face of a tenacious, implacable enemy. And to historians, his willingness to sustain staggering losses against superior American firepower was a large reason the war dragged on as long as it did, costing more than 2.5 million lives � 58,000 of them American � sapping the United States Treasury and Washington�s political will to fight, and bitterly dividing the country in an argument about America�s role in the world that still echoes today. A teacher and journalist with no formal military training, Vo Nguyen Giap (pronounced vo nwin ZHAP) joined a ragtag Communist insurgency in the 1940s and built it into a highly disciplined force that ended an empire and united a nation. He was charming and volatile, an erudite military historian and an intense nationalist who used his personal magnetism to motivate his troops and fire their devotion to their country. His admirers put him in the company of MacArthur, Rommel and other great military leaders of the 20th century. General Giap understood something that his adversaries did not, however. Early on, he learned that the loyalty of Vietnam�s peasants was more crucial than controlling the land on which they lived. Like Ho Chi Minh, he believed devoutly that the Vietnamese would be willing to bear any burden to free their land from foreign armies. He knew something else as well, and profited from it: that waging war in the television age depended as much on propaganda as it did on success in the field. These lessons were driven home in the Tet offensive of 1968, when North Vietnamese regulars and Vietcong guerrillas attacked scores of military targets and provincial capitals throughout South Vietnam, only to be thrown back with staggering losses. General Giap had expected the offensive to set off uprisings and show the Vietnamese that the Americans were vulnerable. Militarily, it was a failure. But the offensive came as opposition to the war was growing in the United States, and the televised savagery of the fighting fueled another wave of protests. President Lyndon B. Johnson, who had been contemplating retirement months before Tet, decided not to seek re-election, and with the election of Richard M. Nixon in November, the long withdrawal of American forces began. General Giap had studied the military teachings of Mao Zedong, who wrote that political indoctrination, terrorism and sustained guerrilla warfare were prerequisites for a successful revolution. Using this strategy, General Giap defeated the French Army�s elite and its Foreign Legion at Dien Bien Phu in May 1954, forcing France from Indochina and earning the grudging admiration of the French. Hanoi�s casualty estimates are unreliable, so the cost of General Giap�s victories will probably never be known. About 94,000 French troops died in the war to keep Vietnam, and the struggle for independence killed, by conservative estimates, about 300,000 Vietnamese fighters. In the American war, about 2.5 million North and South Vietnamese died out of a total population of 32 million. America lost about 58,000 service members. Vo Nguyen Giap was born on Aug. 25, 1911 (some sources say 1912), in the village of An Xa in Quang Binh Province, the southernmost part of what would later be North Vietnam. His father, Vo Quang Nghiem, was an educated farmer and a fervent nationalist who, like his father before him, encouraged his children to resist the French. Mr. Giap earned a degree in law and political economics in 1937 and then taught history at the Thanh Long School, a private institution for privileged Vietnamese in Hanoi, where he was known for the intensity of his lectures on the French Revolution. He also studied Lenin and Marx and was particularly impressed by Mao�s theories on combining political and military strategy to win a revolution. In 1941, Ho Chi Minh, the founder of the Vietnamese Communist Party, chose Mr. Giap to lead the Viet Minh, the military wing of the Vietnam Independence League. In late 1953, the French established a stronghold in the northwest at Dien Bien Phu, near the border with Laos, garrisoned by 13,000 Vietnamese and North African colonial troops as well as the French Army�s top troops and its elite Foreign Legion. After an eight-week siege by Communist forces, the last French outposts were overrun on May 7, 1954. The timing was a political masterstroke, coming on the very day that negotiators met in Geneva to discuss a settlement. Faced with the failure of their strategy, French negotiators gave up and agreed to withdraw. The country split into a Communist-ruled north and a non-Communist south. In the late 1950s and early �60s, President Dwight D. Eisenhower and later President John F. Kennedy looked on with rising anxiety as Communist forces stepped up their guerrilla war. By the time Kennedy was assassinated in Dallas in 1963, the United States had more than 16,000 troops in South Vietnam. General Westmoreland relied on superior weaponry to wage a war of attrition, in which he measured success by the number of enemy dead. Though the Communists lost in any comparative �body count� of casualties, General Giap was quick to see that the indiscriminate bombing and massed firepower of the Americans caused heavy civilian casualties and alienated many Vietnamese from the government the Americans supported. On Jan. 30, 1968, during a cease-fire in honor of the Vietnamese New Year (called Tet Nguyen Dan), more than 80,000 North Vietnamese and Vietcong troops hit military bases and cities throughout South Vietnam in what would be called the Tet offensive. For the Communists, things went wrong from the start. Some Vietcong units attacked prematurely, without the backing of regular troops as planned. Suicide squads, like one that penetrated the United States Embassy in Saigon, were quickly wiped out. Despite some successes � the North Vietnamese entered the city of Hue and held it for three weeks � the offensive was a military disaster. The hoped-for uprisings never took place, and some 40,000 Communist fighters were killed or wounded. The Vietcong never regained the strength it had before Tet. 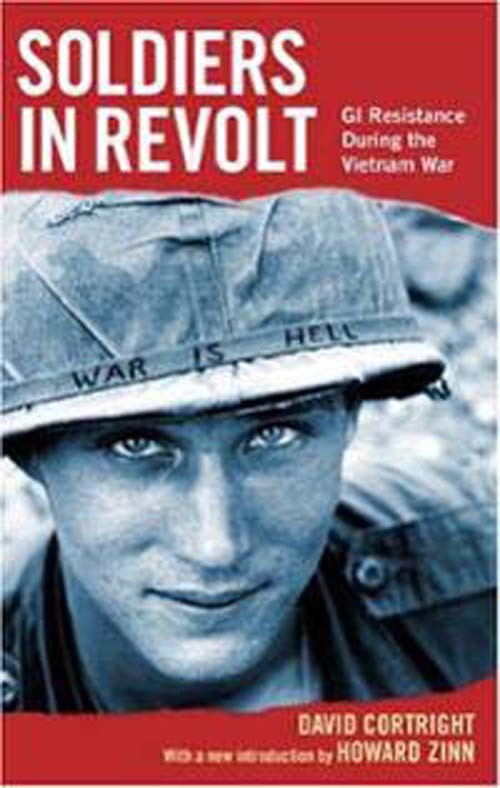 First published during the Vietnam War, David Cortright's Soldiers in Revolt has been republished for a new generation by Haymarket Books in Chicago (above). Despite attempts by the U.S. plutocracy and corporate media to eliminate the stories of the "G.I. Movement" from the histories taught to children during the 21st Century, a new generation is learning the truth about the movements that came earlier.But the fierceness of the assault illustrated Hanoi�s determination to win and shook the American public and leadership. The United States government began peace talks in Paris in May 1968. The next year, Nixon began withdrawing American troops under his policy of Vietnamization, which called for the South Vietnamese troops to bear the brunt of the fighting. In March 1972, the North Vietnamese carried out the Easter offensive on three fronts, expanding their holdings in Cambodia and Laos and bringing temporary gains in South Vietnam. But it ended in defeat, and General Giap again bore the brunt of criticism for the heavy losses. In summer 1972, he was replaced by Gen. Van Tien Dung, possibly because he had fallen from favor but possibly because, as was rumored, he had Hodgkin�s disease. Although he was removed from direct command in 1973, General Giap remained minister of defense, overseeing North Vietnam�s final victory over South Vietnam and the United States when Saigon, the South�s capital, fell on April 30, 1975. He also guided the invasion of Cambodia in January 1979, which ousted the brutal Communist Khmer Rouge. The next month, after Hanoi had established a new government in Phnom Penh, Chinese troops attacked along the North Vietnamese border to drive home the point that China remained the paramount regional power. It was General Giap�s last military campaign. He was removed as minister of defense in 1980 after his chief rivals, Le Duan and Le Duc Tho, eased him out of the Politburo. Too prominent to be openly denounced, he was instead made vice prime minister for science and education. But his days of real power were gone. In August 1991, he was ousted after Vo Van Kiet, a Western-style reformer, came to power. In his final years, General Giap was an avuncular host to foreign visitors to his villa in Hanoi, where he read extensively in Western literature, enjoyed Beethoven and Liszt and became a convert to pursuing socialism through free-market reforms. In March 1972 there were about 60,000 US troops remaining in Vietnam. General Gaip, the NLF, and the North Vietnamese leadership were in peace treaty discussions with the US in Paris. There is a dispute among historians at this point over the diplomatic breakdown of those discussions. But what is not in dispute is that General Gaip authorized a very traditional invasion across the DMZ of what was then the Republic of Vietnam. Initially this attack overwhelmed the US allies and used significant armor and other resources. However, the US through the use of air and sea power, including massive attacks on North Vietnam itself turned back this attack. Thousands upon thousands of North Vietnamese/NLF forces were slaughtered. Hundreds of citizens of North Vietnam were killed in US air raids. South Vietnamese loses were at least 10,000 and US losses in the hundreds including the largest loss of aircraft in combat since probably Korea or since. The US news media largely did not cover this action because of the draw down of US troops. But for those US troops left still in Vietnam it was a harrowing experience, one in many respects worse than the Tet offensive. General Giap effectively destroyed the offensive capacity of his forces and it was three years before he could rebuild his forces and take control over the south. Gaip's 1972 offensive in light of what happened after the full US withdrawal by 1975 was a massive tactical error and waste of his forces. While US Generals in Vietnam pointlessly on occasion wasted the lives of our troops so did General Gaip. Since he was the victor ultimately he appears after the fact to have been a great and wise military leader, like any other general he committed troops to their deaths and sometimes for no good reason. But a troopers lot is not to question why, but rather to fight and die. Rod's right, but not quite. The great peasant armies of the 20th Century were all organized and led by Communists who fought and lead as nationalists. One of their characteristics was to utilize the resource they had in excess (human beings) to counter the advantages of their enemies (who usually had better technology and at first better training and leadership). One of the models that would be studied by Vo Nguyen Giap (but not noted in the obituaries I've read) would have been the way that Georgi Zhukov (and others) reorganized the Red Army following the disasters of the months after the Nazi invasion of Russia. Not every country can afford to "lose" between three and four million of its soldiers and still remain whole. But by 1944 - 45, the Red Army of the Soviet Union was better equipped, better led, and larger in numbers than its adversaries on East Prussia, Hungary, and, finally, Germany. Zhukov's doctrines included "acceptable losses" that would have overthrown governments in Great Britain and the USA. That's why the USA and Britain (with France in for a couple of divisions) gladly let Zhukov do the Battle of Berlin, with its enormous losses (more than the USA suffered in the entire Pacific part of its war, to cite one example). While Russia (and the other "Soviet" states) didn't have an unlimited supply of peasant people power (they also had women flying combat aircraft, operating tanks, and in combat brigades of infantry), it was relative to Germany (and Germany's dwindling number of allies, as Burgaria, Hungary and others "left"), and that was enough. Next came Mao Tse Tung and the Red Army of China. Apparently, Douglas MacArthur had failed to study the model upon which Mao's armies were built: Zhukov's, with Chinese modifications. One of the strangest things about the 1960s was watching university educated Western privileged children quoting the "Little Red Book." The "Little Red Book" was a kiddie's primer of ditties on how an illiterate peasant in uniform should act. The nonsense not only prevailed in the USA, but in France (La Chinois is still one of the funniest movies of the era) and elsewhere, to sad or even tragic results. Mao's oversimplifications were needed for his armies -- but had little to do with how classes should be organized in the USA. But American "radicals" were not the only ones who were misled by Mao and misled him. MacArthur didn't realize that the second largest peasant army on Earth would defend the borders of China, and got one of the biggest surprises in U.S. military history when he got too close to the border as he swept across "North Korea". There are still American veterans (including some brothers in the Chicago Teachers Union) who remember the nasty and bitter cold result of that bit of American arrogance and stupidity. By 1968 and 1972, as Rod notes, Giap was willing and able to order his armies into massive losses in order to slowly push back against the U.S. variant of the "Indochina War." But anyone who had been studying the situation by then knew that one of the most important "data driven" points for the leaders of Vietnam (Ho Chi Minh and Giap, the two most important) was the fertility rate in their peasant areas. One of the reasons Giap said his country could fight the USA for a hundred years was he knew his side had the peasants organized and the peasants were pro-creating more quickly than the casualties were piling up. (His military could also control its casualties by engaging or not engaging in combat). No "modern" nation was willing to make the sacrifices that brought victory to the three great peasant militaries of the 20th Century. One Great Britain had faced the monstrous realities after the Somme, a lot of the course of history was set. One of the more interesting debates about the cultural "revolutions" of the 20th Century could be had about how much of "Women's Liberation" was aided and abetted by the willingness of Russia, China and Vietnam to fully utilize the power and intelligence of women in their militaries from early on. Zhukov had women (the famous "Night Witches") flying combat missions against the Wehrmacht while the USA was still uncertain about the "qualifications" of African Americans to fly combat aircraft -- let alone women. But Zhukov's armies also had women in combat in many other roles, all the way to the infantry in the Battle of Berlin. No one has yet written about how many women were in the crews of the Russian T-34 tanks that eventually overran the German armies on the roads to Berlin, but like submarines, those tanks had to be crewed by people who were not the largest physically but the most agile intellectually and in their reflexes. Of course, the misleadership of Nazism's racial and sexual theories also helped cripple the Reich, despite the advantages its armies had by 1940 and 1941. It wasn't only the failure of the Germans to be able to reap the good will of the people of Poland, Ukraine, Latvia, Lithuania and Estonia because of those racial theories that cost them manpower. The entire mantra of "Kinder, Kirche [sort of] Kuchen" also meant that there was early and growing a "manpower" shortage in Nazi Germany. That's enough for a wake up thought for this morning. If you read para 2 of the New York Times' obituary of General Giap, you see that he "freed Vietnam of colonial rule (France-KS) and fought a superpower (US-KS) to a stalemate." Defeating France is correct. However, he did not fight the US to a "stalemate"--he DEFEATED the US and its South Vietnamese "allies." If you think I'm wrong, ask yourself who was in control of Saigon on April 30, 1975--hint: it wasn't the US or their South Vietnamese allies. Also, note that they say the war cost 2.5 million lives, including 58,000 American lives. Robert McNamara in the movie "Fog of War," said we killed approximately 3.8 million Vietnamese. It's clear that the NYT and its ruling elites STILL can't admit that the US Empire was defeated on the field of battle. Somehow, that can't be fit into the American "story."